* Partake in a little self-reflection. A misaligned mindset toward spending and shopping-compulsive or otherwise-can severely affect your financial and personal well-being. If you think you might have a problem with shopping or spending there are several questions you should ask yourself: Do I feel guilty about shopping? Is my shopping causing financial trouble? Is my shopping, spending, and accumulated debt leading to feelings of helplessness, anger, confusion, fear, or depression? Does the act of shopping and the accompanying interaction with salespeople give me a feeling of worth, importance, and control? Compulsive spending is a serious problem, and if you think you have a problem, you should find help immediately. You won't be able to get rid of your debt until you can figure out what makes you compulsively spend. * Make a plan and stick to it. 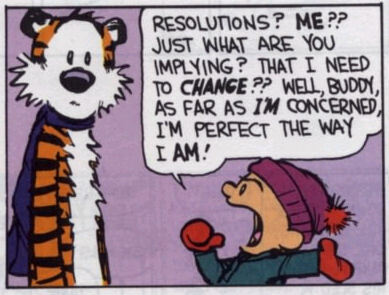 The reason so many New Year's resolutions fail is because we simply state the thing we want to improve on and then never create a plan for helping us get from point A to point B. Most people don't like to plan, unless we're talking about something fun, like a vacation. But actually, planning for your financial future is a little like planning a vacation. You're organizing your money and time so that you get to do all the great things you want when you get there. Look at it that way you might actually enjoy the process. Planning your finances doesn't have to be a long, complicated, dreary chore. In the absence of financial goals and objectives, however, most people's finances simply reflect the history and disorganization of their lives. The first step to successful planning is setting some goals. Decide the best ways to make the most of your money and start working on reaching those goals. By reducing your overall spending, taxes, borrowing, and insurance costs and boosting your rate of savings and investment returns you can turn your financial situation around. * Get rid of your four-wheeled debt. Too many people define necessities by what those around them have. A new $30,000 car is not a necessity, although some people try to make it one by saying, "I need a way to get to work." Guess what? There are plenty of far less expensive used cars out there that will also make it to your office! If you take out an auto loan to buy a car that you really can't afford, and you take a similar approach with other consumer items you don't truly need, you're going to have great difficulty saving money and accomplishing your goals. Moreover, you'll probably feel stressed all the time-which is a poor trade-off for the (short-lived) "new car smell." There are plenty of perfectly good cars out there that are within your budget and that you can actually pay for with cash. And trading in your $30,000 option for one of those will instantly help you free up money that you can use to pay off your other debts or invest in your future. Just think about what it would be like to save that $400-$500 dollars each month rather than throwing it away to pay off the loan on your expensive car. Not having a car payment is a very liberating feeling. * Start making your purchases based on need, not emotion. It can be easy to give in to all of those advertisements telling us how much we "need" that new car, expensive gym membership or trendy outfit. Marketers play on insecurities, fears, and guilt and suggest that you can feel better about yourself by buying their products. You won't be able to overcome spending and consumer debt until you recognize these pressures and how they corrupt your buying decisions. The goal of consumer product companies and their marketing staff is to persuade and cajole you into buying what they're selling. Remember that the next time the thought goes through your mind that you want to buy something that isn't a necessity. It's here, at the point of temptation, when planning out what you can and can't spend comes in very handy. If a product is too expensive for your budget, then you don't need it no matter how much you might want it. * Research before you enter the stores. Prior to going shopping for necessities that aren't everyday purchases-say, a new refrigerator-first do some research. Your research will help you identify brands, models, and so on that are good values. You don't want to make an expensive mistake. When you've checked in with your budget to ensure you can afford it, check in various retailers and compare prices. When you set out to make a purchase, stick to your list. Don't be tempted by all of the other products in a store and don't spend a lot of time wandering around looking at everything. Get in, get what you need, and get out. That's the best way to ensure you won't pick up little things here and there that will throw your finances out of whack. * Watch your food budget. Dine out less and keep stock of the groceries you already have. Learn to cook if you don't know how. Try to keep a healthy inventory of groceries at home. This will minimize trips to the store and the need to impulsively dine out for because your cupboard is bare. Try to do most of your shopping through discount warehouse-type stores, which offer low prices for buying in bulk, or grocery stores that offer bulk purchases. Saving on the amount you spend on food will help you put more money toward paying off your debt and eventually setting money aside for investments. * Become more energy efficient. Check out opportunities to make your home more energy efficient. Adding insulation and weather-stripping, installing water-saving devices, and reducing use of electrical appliances can pay for themselves in short order. Many utility companies will even do a free energy review or audit of your home and suggest money-saving ideas. * Watch what you are paying for insurance. Many people overspend on insurance by carrying coverage that's unnecessary or that covers small potential losses. Coverage of small losses, such as $100 or $200, is not useful for most people since such a loss wouldn't be a financial catastrophe. Take high deductibles on your insurance policies-as much as you can afford in the event of a loss. Also, be sure to shop around. Rates vary tremendously among insurers. Of course, an insurers' quality of service and financial stability are important as well. Ask insurers and agents selling policies to provide depart financial ratings for the company's policies you're considering. It won't be easy getting out of debt, and it's certainly not something you will be able to achieve overnight. Like losing weight, it's something that takes constant dedication but has a great pay off in the end. Whenever you lose focus or feel like giving in, just think about the wonderful benefits of financial well-being. Once you're out of debt the money you are able to invest will mushroom into substantial savings that will allow you to get so much more for your money. Best of all is the peace of mind you'll feel. Debt is emotionally crippling. It's a prison of your own making. Getting out of debt is your ticket to true freedom, and that's a great gift to give yourself and your family now and in the future.